The Dying Days is an apt title for the last New Adventure featuring the Doctor, in any incarnation. 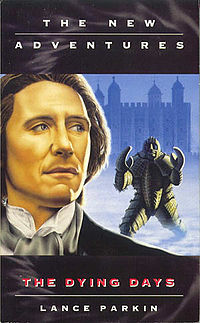 It’s a story of endings and beginnings, and unlike many of the NAs featuring the Seventh Doctor, this novel featuring the Eighth Doctor is a straightforward adventure story, reminiscent of the television series. Bernice Summerfield is waiting for the Doctor to arrive at his house. He’s late, which Bernice thinks is rather unacceptable, since he is a Time Lord. When he does finally show up, he has changed a little. So begins the story that will launch the continuing adventures of Bernice Summerfield, while the Doctor continues on in the new BBC line of books. Before the story ends, you will reacquaint yourselves with old friends such as Brigadier Lethbridge-Stewart and the Ice Warriors. Lance Parkin does a fine job with this novel, sticking to tried and true storytelling techniques, while incorporating elements from the FOX TV movie to maintain continuity. The ending is rather interesting as well. Originally published in the Canadian Science Fiction & Fantasy Resource Guide. The Earth Empire – the Imperium Humanum, upon which a thousand suns never set – is dying. But the Doctor has reckoned without the power of history – which has its own plans for the wayward daughter of the House of Forrester. The fact that this book was rushed to publication so fast was probably the most vile sin of all. Delayed due to Ben Aaronovitch’s hard drive crash, Kate Orman stepped in to finish this much anticipated New Adventure, which heralds the death of a companion. The book has a promising start, but deteriorates into a muddled mess of a narrative. It’s not like I hated the book; I was just very disappointed. There is so much happening in the novel, and it is very difficult to follow. There were even times where I couldn’t figure out why certain parts of the story were there in the first place. So Vile A Sin is definitely full of great ideas and great moments, but put together, it seems that it deserved a little more polishing before going to print. Although So Vile A Sin was a disappointment and a difficult read, it is probably a must for those who have followed the New Adventures loyally. And while I may have panned this particular effort by the authors, I must say that Aaronovitch’s The Also People was brilliant, and I have enjoyed every New Adventure I have read by Orman: The Left-Handed Hummingbird, Set Piece and Sleepy. If there’s one thing I’ve come to expect from Jim Mortimore, it’s a high body count. This book is violent. But overall, it’s a pretty good NA, save for a few complaints. The first complaint is the almost complete absence of the Doctor throughout the novel. When I pick up a NA (at least until BBC Books took over), I expect to read about the Doctor. Not only are his appearances few and far between, I wouldn’t call them ‘quality moments’. What particularly bothered me was the death of a character, which should have provoked some reaction from the Doctor and didn’t. The book also moved a little too quickly, and is hard to follow in some parts. But although the Doctor was difficult to find in Eternity Weeps, Bernice is used well. In fact, the first-person narrative alternates between her and husband Jason Kane, something Mortimore handles rather well. There were some aspects of their relationship which I found a little implausible. Their arguments and foul moods seem somewhat contrived throughout the story. In the end, however, I would say Eternity Weeps is definitely worth reading, especially if you’re a Benny fan. But what is Benny’s father doing five hundred years in his own past? And why has he been waiting for the Doctor to arrive? Can Benny really trust the man she’s been looking for all her life? Although I had to pan Kate Orman’s efforts on So Vile A Sin, I think Return of the Living Dad has to be one of the best New Adventures I have read since the series began. Orman has proven to have the ability to weave humor, adventure and good storytelling together to create a great NA, and Return of the Living Dad is no exception. At last, Bernice has the opportunity to find her father, and the result is a novel strong on both characterization and plot. There are also plenty of surprises in store for everyone, including Chris and Roz. As usual, Orman writes the Doctor as a three-dimensional character, and uses the entire NA cast to their fullest, including Jason Kane. This book is also a good indicator of what’s possible with the character of Benny as she sets out as the main star of the NAs beginning with Oh No It Isn’t! by Paul Cornell. ‘Stay the hell out of my mind,’ hissed Forrester. ‘Just stay away from me.’ She turned and stalked out of the room. Chris put his head in his hands. But when the Doctor and his companions arrive they find a virus sweeping through the population, unleashing the colonists’ latent psychic powers. The Doctor and Chris fall prey to the infection, and discover telepathy is not the only symptom. Chris is unable to resist the call of an ancient place of sacrifice, while Roz and Benny travel back in time to the origin of the virus, and uncover a desperate bid for immortality. And all the while the Doctor is playing a dangerous game with troopers of the Dione-Kisumu company, who have come either to reclaim the stolen biotechnology — or to sterilize the planet. Kate Orman is still the only New Adventures author who is not male and not British. Whether or not it makes her a great writer, I can’t say, but Sleepy was an enjoyable read, perhaps because it had a simpler plot than her previous Who novels, The Left-Handed Hummingbird and Set Piece (which I heartily recommend). The Doctor and his companions arrive on an Earth colony where the colonists are coping with the emergence of latent psychic abilities. For once, the Doctor knows little in advance about what’s going on, but is committed to helping the colonists. He and Chris fall prey to the virus unleashing the colonists’ psychic abilities, while Benny and Roz go back in time to find answers. The situation is further complicated by the arrival of armed forces sent by the company that sponsored the colonization, and may have in fact planned the disaster as an experiment. So far, this doesn’t seem like the most original plot line, but Orman throws in enough twists to make it a worthwhile read while also writing the Doctor and his companions the way they should be written. Benny has got to be the greatest companion to date, despite the fact she’s never appeared on-screen. Roz and Chris don’t have major roles in the story, but at the same time it doesn’t seem as if they were plugged into the novel as an afterthought. Some fans have complained the Doctor has become a very dark, manipulative character in The New Adventures, but Orman keeps him balanced, throwing in humor reminiscent of the television series, but giving him depth by keeping him the most reflective, pensive Doctor to date. All in all, Sleepy is one of the best New Adventures for 1996, and Orman fans won’t be disappointed.